architecture - BrainstormOverload - Small design studio. Big ideas. PBS has done it again. An intriguing look at intelligent people doing interesting things. Nothing blows up. There are no scantily clad women. No murders. No esp flashbacks at the scene of a horrific crime. And, there will be no commercials – hallelujah! If you are not used to television of this quality you’ll be delighted to know you have until Summer to work up to it. Start by checking out the trailer at citizenarchitectfilm.com. “Citizen Architect: Samuel Mockbee and the Spirit of the Rural Studio is a documentary film on the late architect Samuel Mockbee and the radical educational design/build program known as the Rural Studio.” In short it looks like one of those stories that is simultaneously heart breaking and deeply inspiring. Reminding us of the power of our creative energies and how meaningful it can be to contribute them without thought of reward. Whatever you believe about global warming 2009 demonstrated that the governments of the world aren’t prepared to do much about it. Yet I suspect most of us appreciate that treading lightly and nurturing our planet are good ideas. The truth of this fact is all around us and the tools to contribute to reducing your personal impact are nearer at hand than ever before. There are many small things you can do that are improvements on multiple levels. For instance, you can replace your battery hungry flashlight with one that you crank by hand. Not only will you save money and prevent all those heavy metals from entering the landfill (and eventually your drinking water) every time you pick up your flashlight it will actually work! There are also some big things you can do like changing the car you drive and the home you live in. Buildings account for a massive portion of the energy we use and as with the flashlight bringing your home up-to-date has many advantages like energy savings and the opportunity to mold your home around the way you live rather than the other way around. Why wait for the G-men to get their act together when you can get going right now? For a little inspiration check out the terrific collection of 62 innovative green homes on jetsongreen.com. They’ll pique your appetite for improvements large and small. Shelter Architects has completed one of the first LEED Platinum residential houses in the Nation. And not just any ol’ place in the nation – right here in Minneapolis on Washburn Avenue near Theodore Worth Park. Not only is the design a nice break from the endless rows of traditional houses but the materials are up-to-date as well. The home boasts energy star lighting, no-voc finishes, recycled and fsc finish materials, and even reclaimed flooring and tile. They score on all three counts: reduce, reuse and recycle. Check out Shelter’s site for more or if you’re local make the pilgrimage one day when the weather is nice… late May perhaps. Tucked away in a little neighborhood just below the Flatiron Mountains in Boulder, Colorado lies the Sampson House by Tician Papachristou. Make sure you take the time to actually sound out his name because despite looking unfamiliar it will roll off your tongue with the same comfortable charm that this house inspires. It’s amazing how a home built in 1958 can escape looking dated over 50 years later. In part it is the simple honesty of the wood siding and bare concrete. The shape is intriguing and makes even more sense when seen in context with the dusty red peaks that soar almost 1,000 feet above. I believe the yellow trim is a recent addition but it serves to emphasize the way the roof line parallels the slope. Together these design details ensure the house feels rooted to the landscape but also celebrates the jagged mountains that surely inspired it. 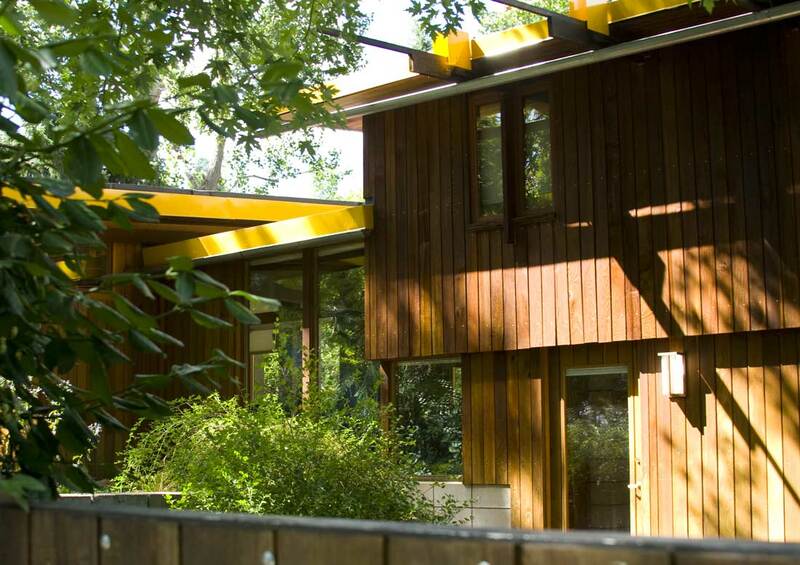 It was also likely inspired by the long, low lines of Frank Loyd Wright’s Usonian homes. Tician collaborated on a few projects with a more famous architect Marcel Breuer. Breuer was brilliant without a doubt and it must have been rewarding to collaborate but unfortunately seems to have overshadowed Tician’s own work which is wonderful in its own right. If you’re ever in Boulder take a moment to walk by. The Twin Cities Homes By Architects tour is coming up September 19 and 20, 2009. There are a few interesting modern numbers including 4869 Dominica Way (pictured below) by Altus Architecture and Design. There are quite a few – shall we say – “traditional” homes on the tour so you may want to take a look at the full portfolio before you spring for tickets. Fortunately, the site includes a detailed map so you could swing by the ones you like the look of and then get tickets if you are just dying to get a peek inside. One of my very favorite spots in the Twin Cities is tucked away down a little side street in what must be one of the most beautiful settings I’ve seen. While very close to all the wonderful things the city has to offer (like milkshakes) approaching this spot is like leaving it all behind. Every time I ride my bike by I leave feeling relaxed. The house itself is unique and handsomely designed but not ostentatious the way well funded homes often feel the need to be. It nestles into the side of the hill like it grew there years ago. What’s growing right next to the house is a big part of what makes it so special. A full lot worth of Japanese style garden plays out in a myriad, tranquil shades of green. Backing up against a park allows the garden to take full advantage of the borrowed landscape. The garage is a recent edition and makes the entry to the house even more private. A feature that makes the fact that the owners have generously shared unobstructed views of their garden even more of a gift. Larger photographs are available on flickr. One of my design professors once told me “A designer should never take the same route to work two days in a row.” Going on he explained that the repetition dulls our ability to perceive the details afresh each time. I’ve followed his advice for 17 years now and have traveled for miles going around ‘just one more bend’ at a time. Just the other day I took a different turn and discovered this fun little house just a single block from a house I’ve been by many times. Interestingly, the day after taking these pictures the home (at 1912 Norfolk Ave. in Saint Paul) went up for sale. There is a corner stone (unusual for a residence) listing the architects Bergstedt and Hirsch which is also unusual since they designed things like Mount Zion Temple on Summit Avenue so it’s possible this is just another one of a number of interesting reclaimed materials. Then again I believe the house is currently owned by an architect so you never know. If you’re not in the market you might still enjoy going to an open house to see some of the interesting solutions on display. And who knows what else you’ll find – just around the bend.